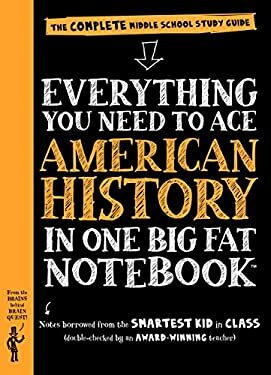 It's the revolutionary American history study guide just for middle school students from the brains behind Brain Quest . Everything You Need to Ace American History . . . covers Native Americans to the war in Iraq. There are units on Colonial America; the Revolutionary War and the founding of a new nation; Jefferson and the expansion west; the Civil War and Reconstruction; and all of the notable events of the 20th century--World Wars, the Depression, the Civil Rights movement, and much more. The BIG FAT NOTEBOOK(tm) series is built on a simple and irresistible conceit--borrowing the notes from the smartest kid in class. There are five books in all, and each is the only book you need for each main subject taught in middle school: Math, Science, American History, English Language Arts, and World History. Inside the reader will find every subject's key concepts, easily digested and summarized: Critical ideas highlighted in neon colors. Definitions explained. Doodles that illuminate tricky concepts in marker. Mnemonics for memorable shortcuts. And quizzes to recap it all. The BIG FAT NOTEBOOKS meet Common Core State Standards, Next Generation Science Standards, and state history standards, and are vetted by National and State Teacher of the Year Award-winning teachers. They make learning fun, and are the perfect next step for every kid who grew up on Brain Quest . New (215 available) BRAND NEW. Over 1.5 million happy customers. 100% money-back guarantee. Make your purchase count: support Better World Books' worldwide literacy partners.